Marcio has studied engineering and teaches science and sustainability as a volunteer. He was concerned that schools in his remote state of Mato Grosso have difficulty accessing educational and technological materials and students are therefore excluded from the benefits of scientific research. In collaboration with the state’s university and SENAI, a network for the technical education of young people, Marcio has established the Junior Scientific Starter Programme at a range of schools, giving lectures locally at his own expense. He has created a methodology for applying scientific and technical concepts in students’ everyday lives. Marcio encourages them to do their own scientific research, question the standard way of doing things and come up with innovative improvements and new products that solve local problems in a sustainable manner. 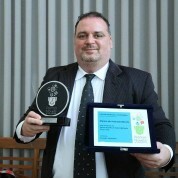 He mainly works with female students from poor families, several of whom have won prizes for their work. One particular invention of making bread from whey cheese won the most important scientific prize in Latin America, the Young Scientist Prize. Marcio’s student received the prize directly from the President of Brazil, Dilma Rousseff. In 26 years of the prize’s history, Marcio’s state had never won this scientific award. Marcio himself has also received several prizes in recognition of his contributions to education and scientific development in Brazil. Join the #TeachersMatter movement by sharing Marcio de Andrade Batista’s update.